310 pages | 145 B/W Illus. The energy supply and demand system is of great importance for society, from economic, social, and ecological viewpoints. The last decade in particular has seen rapid changes in the world of energy systems, and it is therefore now an important area for study, academic research, and professional work. 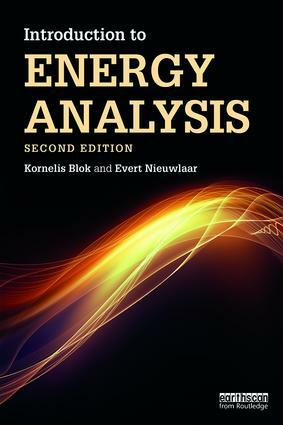 This textbook provides an introduction to energy analysis for those students who want to specialise in this challenging field. In comparison to other textbooks, this book provides a balanced treatment of complete energy systems, covering the demand side, the supply side, and the energy markets that connect these. The emphasis is very much on presenting a range of tools and methodologies that will help students find their way in analysing real world problems in energy systems. Featuring learning objectives, further readings and practical exercises in each chapter, An Introduction to Energy Analysis will be essential reading for upper-level undergraduate and postgraduate students with a background in the natural sciences and egineering. This book may also be useful for professionals dealing with energy issues, as a first introduction into the field. Kornelis Blok holds a Chair in Energy Systems Analysis at Delft University of Technology, The Netherlands. He has authored and co-authored over 100 articles in peer-reviewed scientific journals, several books and 250 research reports, conference contributions and other scientific publications. He was a lead author for the Third and Fourth Assessment Reports of the Intergovernmental Panel on Climate Change, the organisation that was awarded the Nobel Peace Prize in 2007. Evert Nieuwlaar is Assistant Professor of Energy Analysis at the Copernicus Institute of Sustainable Development, Utrecht University, The Netherlands. He has more than 30 years of experience in research and education in the field of energy, environmental and sustainability issues. He teaches courses in thermodynamics, energy conversion technologies, energy analysis (introductory and advanced) and life cycle assessment. Many new exercises have been added, but most of the exercises in the first edition are also in this edition (often adapted and updated). The following Excel file lists all exercises, whether they were also in the first edition (with their number) and if they were changed. Full answers to all 140+ exercises are available on the Routledge website for instructors only. The file below gives you short (final) answers for selected exercises. Each chapter in the book ends with a number of exercises. Most of them are quantitative in nature requiring calculations. Many the questions are not closed in the sense that not all information needed for answering is given in the exercise itself. Often it is necessary to lookup data in the book (sometimes elsewhere), or assumptions need to be made. Also note that some questions require (a lot of) repetitive calculations (for example 3.12, 5.11, 7.10, 11.5, 12.6, 12.9, 14.6, 15.6, 15.7 and 15.8). Such questions could best be answered using spreadsheet software like Microsoft Excel or other software. Always keep track of units and present answers with the proper unit; errors can often be prevented by carefully noting the units of the parameters used in the calculations; use the same algebra for the units as you did with your numerical calculations to find out if you end with the proper results including their unit. At the end check whether the answer(s) found make sense, for example that they do not violate the first and second law of thermodynamics. We hope that this guidance and solutions are useful in your course, and welcome your feedback. Please send your suggestions, comments (and errata if you find them) to Kornelis Blok (K.Blok@tudelft.nl) or Evert Nieuwlaar (E.Nieuwlaar@uu.nl).